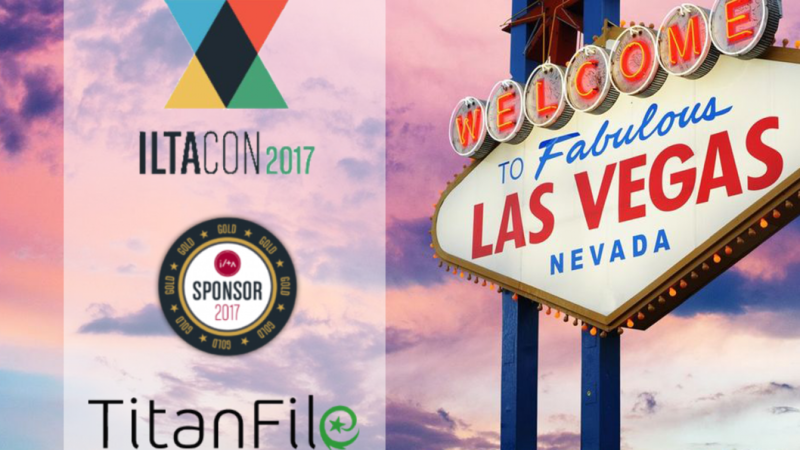 TORONTO, ON – As thought-leaders of legal technology innovation and strong proponents of the legal community, TitanFile Inc., a file sharing solution and correspondence tool for legal professionals, announces their attendance and sponsorship of ILTACON 2017, the International Legal Technology Association’s biggest event of the year. The conference is a premier event for the legal sector designed to add value to professionals through networking and education. The four-day event will be held August 13th to 17th at the luxurious Mandalay Bay Resort and focuses on providing like-minded professionals with the opportunity to collaborate on industry strategies and discover solutions on challenges. Attendees will have the opportunity to learn through workshops and keynotes, and network through activities, such as golf. Sponsors will be able to showcase their products at booths in designated vendor areas. As five-time annual attendees of the event, TitanFile is excited to extend their continuous support to the International Legal Technology Association and the legal community. As gold sponsors, TitanFile has achieved a privileged status recognizing their contributions to the association. TitanFile looks forward to showcasing their platform’s newest additions, as well as providing insights to professionals on optimizing workflow and improving firm security. TitanFile can be found at Booth #337. TitanFile is an award-winning, easy and secure way for professionals to communicate without having to worry about security and privacy. TitanFile automatically organizes messages and documents around clients, groups or projects, reducing filing overhead and increasing productivity. Multi-level encryption, granular access control and full audit trails ensure compliance and make TitanFile the best choice for secure communication. For more information, please visit www.titanfile.com.